Lewis Hamilton clinched his fourth ­drivers' world championship in unexpected but ­dramatic fashion on Sunday when, after a first-lap collision with title rival Sebastian Vettel, he finished ninth in the Mexican Grand Prix. Vettel, already a four-time champion, came home fourth for Ferrari after driving through the field from 19th following his part in the ­early crash with Hamilton. He also pitted for a new front wing. 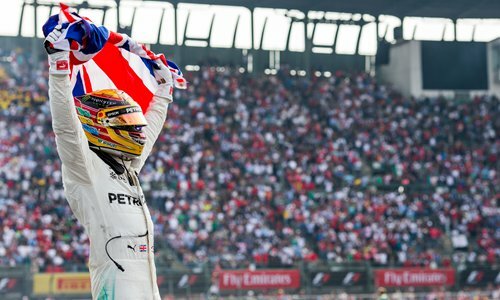 Hamilton's title triumph made him the first Briton to be a four-time champion, elevating him clear of Jackie Stewart, and alongside Vettel and Frenchman Alain Prost. Only German Michael Schumacher with ­seven titles and Argentine Juan-Manuel Fangio on five have claimed more championships than the Englishman. "I'd like to say a big thanks to everybody in this Mercedes team," said Hamilton. "What you've done the past couple of years is incredible. I'm so grateful." "Four is a great number. But I want number 5 now," declared Hamilton, who also races with the number 44 on his car. "I want to go out at the top ... I could do the easy thing, like ­obviously Nico [Rosberg who quit days after winning last year's F1 world championship] did, which is just stop and retreat with these four ­titles. But I think there's more in me. "I think there's more to come, more of a challenge."